Dr Meredith Doig, president, of the RSA. 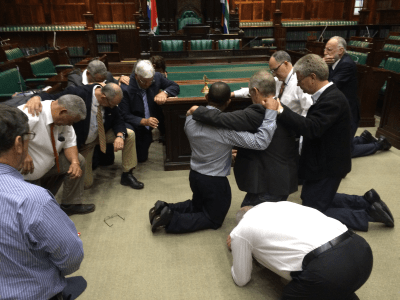 The Rationalist Society of Australia (RSA) welcomes the opportunity to make this submission relating to parliamentary prayers in the Senate. The RSA is an independent not-for-profit organisation, advocating for a secular Australia in which public policy is guided by evidence, reason and compassion. Founded in 1906, the RSA is the oldest freethought group in Australia. The RSA believes a secular government is necessary to ensure the human rights of all Australians are adequately protected. When governments accord privileges and power to one group, they necessarily discriminate against other groups. Secularism allows for diverse belief systems to co-exist and flourish because it prevents government, public policy and administration disproportionately favouring the interests of any one group. 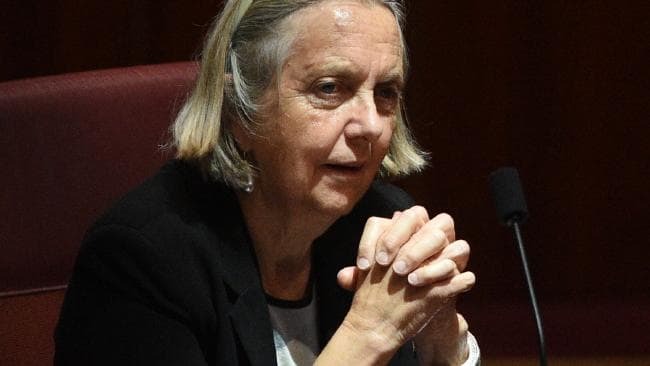 Greens Senator Lee Rhiannon has proposed replacing the Christian prayers read out at the start of each Senate sitting day with a more general statement of prayer and reflection. Australians are no longer a universally Christian people. A Christian prayer is therefore unsuitable as an expression of a shared value held by the populace. The last census recorded the total number of Christians at approximately 52%. Almost half of all Australians subscribe to other belief systems, including 30% who record no religious beliefs. Further, even within Christianity there is substantial diversity of belief. It is doubtful the specifically Protestant expression contained in Standing Order 50 would be acceptable to all Christians. When parliamentary prayers were introduced in 1901, the Catholic Archbishop of Melbourne objected to the wording complaining they were “distinctly Protestant”. As an instrument of our democracy, the parliament of Australia is designed to represent the people of Australia. Given point 1, a Christian prayer is manifestly unsuitable as a representative statement applying to all Australians. Given nonbelievers account for over 30% of our population, (the largest demographic group recorded by the census), religious prayers and ceremonies are no longer appropriate representations of our democracy. For the reasons mentioned in point 1, the institutions of our democracy should represent and reflect the diverse belief systems of the people. Our symbols and rituals should focus on those things that unite us, rather than those which divide. Given our populace is increasingly irreligious, religious practices and rituals should be used sparingly if at all in public settings, and certainly not used to imply an assumed unanimity of belief, as is the case with prayers in parliament. Recent surveys record only a small percentage of Australians who attend religious services regularly – somewhere between 8%-15%. Many of those who identify as Christian in the census are in fact “nominal” Christians only, in that they do not regularly pray or attend church, and often hold to the traditional tenets of the religion only loosely. This is evidenced in strong “Christian” support for issues which stand at odds to traditional Christian teachings – eg, marriage equality, abortion and voluntary assisted dying. Low levels of religious observance is a strong argument against enforced religious observances in our key institutions. Members of the Senate hail from different ethnic backgrounds and faith traditions. The suggestion in Standing order 50 that Senate members are “servants” of the Christian God is patently false and may be offensive to some. The President of the Senate is obliged to recite these prayers. But what if the President is not a Christian, nor even a believer? Enforcing religious observances risks putting a high official in an impossible position: either refuse to comply or wilfully misrepresent their authentic beliefs. For those of other faiths, forcing them to recite prayers constitutes a violation of their rights to religious freedom as described by Article 18 of the ICCPR. There may even be some Christians who strongly oppose their prayers being recited by those who plainly do not commit to their beliefs. Commencing parliament with an acknowledgement and prayer of one faith to the exclusion of all other belief systems privileges one faith to the exclusion of all others and of none. Standing Order 50 implies our country is universally Christian, sending a message about our country which is demonstrably untrue. The role of parliament in our modern democracy is to enact the will of the people. In contrast, Standing Order 50 “beseeches” God to ensure that “Thy (God’s) will be done”. It asserts the purpose of parliament is not only the “true” welfare of the Australian people, but the advancement of “Thy glory”. One could be forgiven for thinking, in light of the use of the word “true”, that the main purpose of parliament is to serve the interests of the Christian God. Not only is such a statement of purpose inconsistent with the beliefs of many Australians, it is also factually wrong. The purpose of parliament is not the advancement of God’s glory. The opening rituals of parliament are symbolic and do not usually bear on the business enacted in a daily basis. However, symbolism matters: it represents a set of shared beliefs. It is not desirable that the opening ritual of parliament stands at odds with the legislative agenda. It’s also undesirable that the tenets of Christianity are reinforced to the exclusion of all others, in the key moments preceding the enacting of parliament. This gives Members a misleading sense of our shared values, and provides an unfair advantage to those seeking to advance legislation in support of traditional Christian beliefs. For example, prayers before parliament are often cited as evidence of the nature of our country in debates where religious beliefs are contrasted with human rights. We agree that ritual is important. That’s why it should appropriately reflect our actual diversity, not some nostalgic view of the past. Forcing parliamentarians to participate in a religious practice is at odds with the Australian Constitution which prohibits laws for imposing religious observances. Standing Order 50 might be susceptible to challenge if Standing Orders are considered “laws” by the High Court. In an article in The Conversation, Associate Professor Luke Beck argues that similarities between our laws and constitution with the laws and constitutions of Britain, Canada and the US mean that such a challenge may succeed. But the persistence, courage and resources needed to mount such a challenge are probably beyond us at this stage. When prayers were introduced to parliaments in 1901, Australia was 97% Christian. Even then, the principle of secularism was important enough to ensure a robust debate. With the passage of time, Australia has flourished to become culturally and religiously diverse. Our parliament should reflect the shared values and diversity of our people. Christian parliamentary prayers are unrepresentative of the Australian people, and Standing Order 50 should be changed to a statement more reflective of the shared beliefs of Australians and their parliamentary representatives. Such a statement provides an appropriate balance between religious and nonreligious sensibilities, allowing each individual the opportunity for reflection in a way consistent with their own beliefs. A more explicit reflection might take the form of the attached “Alternative to Prayers before Parliament”, written by RSA President Meredith Doig. What might we expect from those who argue against change? Christian lobbyists will no doubt wheel out the claim that a change which is unfavourable to Christianity represents an “attack on Christianity”. However, this fails to distinguish between lobbyists favouring a cause, and whether the change is justified or not. A change to Standing Order 50 simply acknowledges the reality that we are no longer a universally Christian country. This is not an attack on Christianity, merely a recognition of the reality of our demographics. Quite the reverse. Religious freedom, as explained in the ICCPR, is intended to protect the beliefs of those of any faith and of none. Religious freedom does not apply to any one faith, or even the most popular faith. The principle of religious freedom supports the idea of a parliamentary reflection that does not unfairly discriminate against any belief system. One anticipates the argument that we must respect our history and our traditions, and that we lose something by invoking any kind of change. However, the argument for tradition does not support maintaining traditions which are no longer representative or beneficial to their intended purpose. Such is the case with Standing Order 50. Traditions should not be maintained for the sake of it. Such an argument is self-referential and thus invalid. An argument is often made invoking the fallacy of relative privation that “there are more important issues”. Recognising that there are larger problems does not compel us to ignore smaller problems. The RSA believes that a century after Federation, Standing Order 50 is manifestly at odds with the religious diversity of Australian society. Our legislature should take the opportunity to remedy this situation by proposing a reflective statement more in tune with our shared beliefs and aspirations as a nation. We come here today to do the business of governing. Members of this Parliament have pledged to improve the quality of this community and are entrusted with doing so. As we gather, let us remember that though we have differences, we are linked by our common humanity. We embrace many traditions and represent many demographics. We are Christians, Jews and Muslims, Hindus, Buddhists and Sikhs, humanists, atheists, rationalists and skeptics, the unaffiliated and the uncertain. We represent many races and nationalities, men and women, young and old, and all in between. We identify as libertarian, liberal, progressive, and conservative. To be sure, we do not agree about everything and we often feel fiercely protective of what we believe. But there is one thing on which we can all agree and that is, the goal of making our community the best it can be. We unite here today with that noble aim and common purpose. Our meetings should be characterised with a healthy dose of humility and doubt, being receptive to the ideas of others and having the willingness to change our beliefs given good reason, argument, and evidence. Let us not have intellectual arrogance or emotional intransigence. Let us remember that our beliefs inform our actions and, translated into real-world impact, have the potential to help or harm others. So, in the spirit of goodwill and common decency, may we always show respect to others, compassion for the needy, and integrity in our actions.